When OEM Magazine spoke to a handful of North American machine builders about how they handle vendor managed inventory (VMI), it seemed there wasn’t much to say. When dealing with nuts, bolts and other smaller machine components that OEMs have typically organized inventory with vending machines or designated bins monitored by the vendor. While a good VMI system keeps inventory stocked, shortens lead times and lowers overall component costs, OEMs wonder what an even better system could accomplish. Which poses the question: Are there any new innovations around VMI that can improve the way inventory is handled? From digital inventory management systems to multi-product weigh scales and predictive replenishment, the VMI landscape—while seemingly stagnant—is ripe for revitalization. The OEMs that adopt VMI best practices will benefit from new-found inventory efficiencies, which ultimately leads to higher customer satisfaction. Stan Wolf, branch manager at Motion Industries, a supplier of bearings, pneumatics, hydraulics and mechanical power transmission products, says that while nothing revolutionary has hit the market to date, new opportunities revolving around IIoT and remote monitoring are in the stars for VMI. But perhaps making the most out of VMI is less about new innovations and more about how OEMs and suppliers are maximizing their supply chains and breathing new life into traditional VMI methods. Kochar came to Pearson four years ago with a goal to shake up how the OEM looked at and managed its supply chain. With experience at highly supply chain-centric companies like Amazon and Dell, Kochar analyzed how he could bring a more streamlined supply chain into the packaging OEM’s facility. Working with Fastenal, a Winona, Minn.-based company that provides manufacturers with fasteners, tools and supplies, and its Smart Label program, Kochar created a VMI system for Pearson, which has helped the OEM adhere to quick lead-times and improve productivity. Pearson’s shop floor has 200 bins, each with its own component, and these bins are now organized by color-coded bays and lines. Until just a few months ago, if someone asked Kochar where a specific bolt was located on the plant floor, he didn’t have a process in place to locate it. With the new Smart Label program, Kochar and other Pearson employees can easily locate the part by which bay it’s located in. But Kochar isn’t stopping there. He envisions expanding the Smart Label system even further, while also using Fastenal’s new Fast360 inventory monitoring program. In 2017, Fastenal launched Fast360, which has been engineered to give OEM customers insight into their organization’s relationship with Fastenal. This Fastenal exclusive provides builders with critical supply chain information and insight. OEMs can search, compare and manage their supply chain with three easy to use modules that are directly incorporated within Fastenal’s e-commerce platform, says LaDon Smith, one of Fastenal’s district managers. Coiled vending machines housing gloves, safety goggles, nuts, bolts and other components can be found throughout many OEM plant floors, but they aren’t Kochar’s favorite form of VMI. “The drawback with these machines is that they only dispense one item at a time. So, when my assembly technicians need five things, they have to enter the part number five different times,” Kochar says. To improve productivity in this regard, Kochar turned to Motion Industries’ secured, scale-based machine, which houses 30–40 different weighted bins filled with components. Engineers can scan their badge to open the machine’s main door to access all of the components at once. Because the machine is scale-based, engineers can grab multiple items from different bins and the machine knows exactly what is taken. Once the employee closes the door and scans out of the system, the machine sends real-time stock level data to Motion Industries so they can predict when Pearson may need its stock replenished. What about VMI for controls? Because controls platforms often differ from assembly to assembly, a VMI system for controls components may not make the most sense. However, Rockwell Automation, Milwaukee, Wisc., introduced a platform called Design for Supply Chain, which isn’t exactly VMI, but in a similar realm, it helps ensure OEMs have the products they need, without supply-chain interruption. The program involves reviewing an active customer’s bill of materials to determine if they are using currently preferred, available products that are stocked by their distributor. In collaboration with an OEM’s distributors, Rockwell Automation reviews their customer’s bill of materials once a year to evaluate the company’s complete supply chain. By scrubbing the bill of materials, Rockwell Automation is able to identify if there are any opportunities to migrate the OEM using a product nearing mature lifecycle status over to an active, preferred and available product. The supplier has more than 33,000 preferred products that are available with quick delivery, which can help OEMs meet competitive delivery times and reduce the need to accelerate or expedite orders. Some of the OEMs who have used Design for Supply Chain have reduced their part numbers, which saves them thousands of dollars every year in labor and procurement scheduling costs, Throne says. It’s also helping them with their deliveries and staging. ARPAC, based in Schiller Park, Ill., is an end of line packaging equipment manufacturer that assisted Rockwell in developing this program in 2010. Since the inception of Design for Supply Chain, Rockwell has closely audited the impact the program has had on ARPAC. The most recent analysis identified very few long lead times. In addition, ARPAC’s use of the platform has streamlined the machine building process. For the past three years, Fastenal has offered a more hands-on approach to VMI through its on-site program where Fastenal invests in employees who actually become a part of an OEM customer’s team. The employees then set up a shop in the OEM’s facility and manage the customers entire supply chain. Fastenal owns and monitors all of the inventory, which is appealing to most OEM customers as it lines up well with customer’s key performance indicators, says Fastenal’s Smith. The program has been shown to improve on-time delivery, inventory accuracy, total cost of ownership savings and service. So, while VMI may appear to be an ancillary aspect of the business, new approaches with supplier partners are streamlining the supply chain in a way that is increasing efficiencies and reducing costs for the machine builders and their customers. OEMs just have to think out-of-the-box when it comes to components in the bin. OEMs and suppliers should have a monthly or quarterly meeting to make sure both parties are always on the same page. An honest and transparent relationship keeps ARPAC and Rockwell tight-knit. When OEMs are reevaluating how much stock they do or don’t need, suppliers should also be in on these conversations so they know what to expect. Creating partnerships with suppliers and distribution channels allows OEMs to drive their labor, procurement and logistics costs down through continuous improvements of their supply chain efficiencies. Partnerships allow OEMs to focus on what they do best, which is manufacturing machines and innovating, and helps them differentiate in a globally competitive landscape, Throne says. VMI should not be about driving down the cost of your suppliers, rather it should be more about looking at the overall cost and value. In collaboration with an OEM’s distributors, Rockwell Automation reviews their customer’s bill of materials once a year to evaluate the company’s complete supply chain. This is a screenshot from the company's Design For Supply Chain platform. 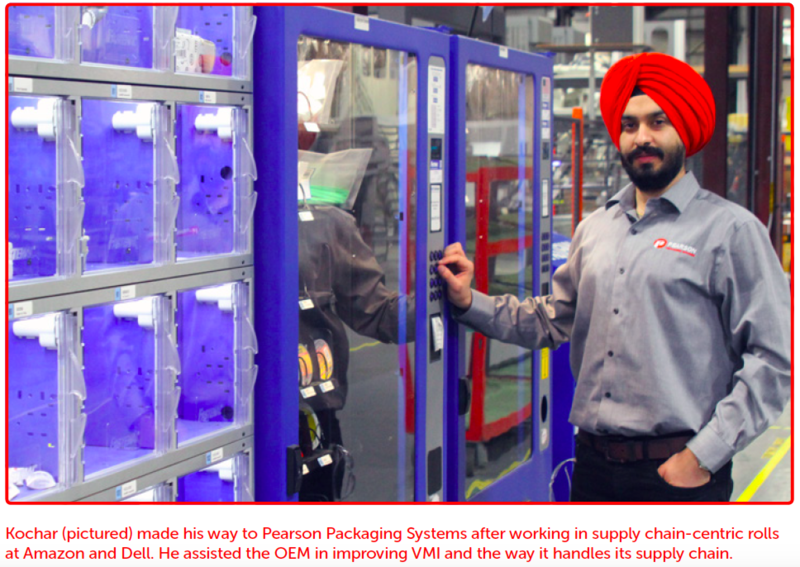 Prabh Kochar (pictured) checks in with his credentials and then grabs inventory from the Motion Industries’ weigh scale Pearson has on its shop floor.